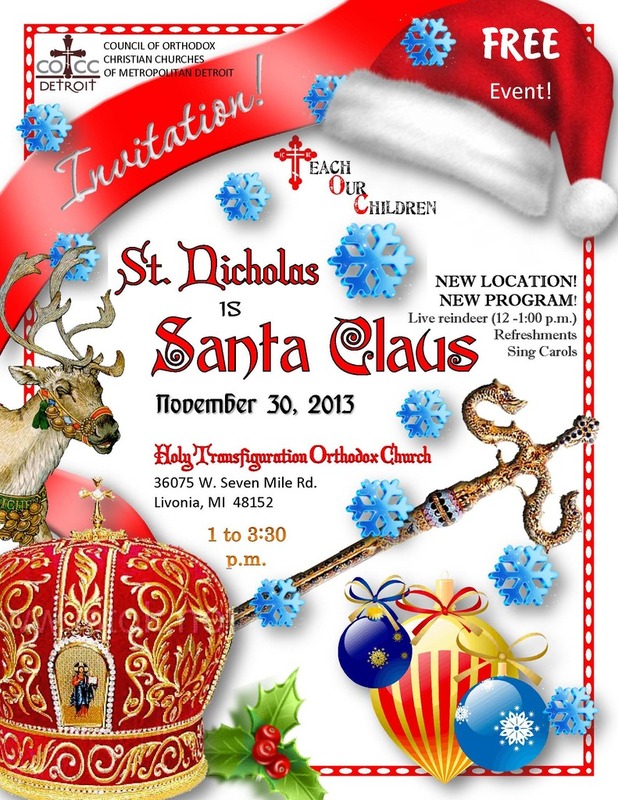 The fourth annual COCC “St Nicholas is Santa Claus” event was a success! Hosted at Transfiguration Church in Livonia, the lively afternoon began with host priest, Fr John Wehling's blessing in the fellowship hall that was transformed into a winter wonderland by volunteers led by Heidi Webb. Two live reindeer and great Christmas music by Angel Skye (Angel Brock and Scott Linzell, from Holy Cross Greek Orthodox Church, Farmington Hills, were big opening attractions. The 90 some kids made edible Christmas candles to remind them of the light of Christ Jesus and that He came into the world that we may also walk in His light. Craft volunteers, Michael, Mark, and Sarah (St Mary Antiochian Parish, Livonia), reported that some children missed the instructions or just chose to forego assembly and ate the cookies, sprinkles, candy “parts” and frosting “glue” — but there were no complaints about quality and taste. Parents and grandparents alike enjoyed watching the children work at their project. Caroling and Christmas Bingo were a lot of fun. The best part of the afternoon, however, was when Father Nicholas, Archbishop of Myra in Lycia, arrived in his Orthodox vestments and shared his life story with everyone. The children listened intently about his acts of love and charity to many people, especially to children. Everyone learned the truth about how we have come to know St. Nicholas as Santa Claus. He invited the children to participate in his interactive story telling and singing. Elizabeth Star (St Innocent parish), arranged for twelve residents from American House Westland (Assisted Living) to attend as guests. They received beautiful glass ornaments from Bronner's in Frankenmuth and had a table-side visit by St Nicholas, enjoyed the kids, crafts and festivity. Fr John gave church tours requested by quite a few families, some of whom had never been in an Orthodox church. The COCC thanks chairman Richard Shebib and committee; Transfiguration parish; the Webb, Appling, Graban, Emerick, Sedor, and Curtis families, the young adult and teen volunteers from St Mary's Basilica (Livonia), St Innocent (Redford), and Transfiguration (Livonia), and to the entire pan-Orthodox community for supporting this important COCC mission to help “Teach Our Children”.